'Dickens and Massachusetts: A Tale of Power and Transformation' is a major exhibition exploring Dickens’s travels in Massachusetts and America, including his memorable 1842 visit to Lowell. 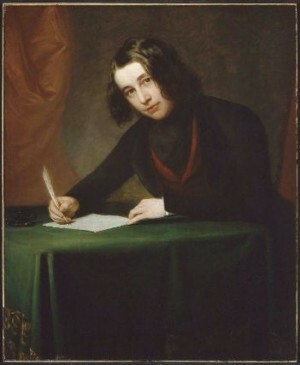 Featuring rare, little-seen Dickens artifacts from eight major collections and museums (including Francis Alexander’s acclaimed 1842 portrait, receiving its first public viewing in 30 years), 'Dickens and Massachusetts' catches this literary lion early in his brilliant career—as a young man discovering his creative powers and his growing influence as a public figure and social reformer. It examines how Massachusetts influenced his work, and how that work in turn continues to influence and transform new generations of readers. Sponsored by the University of Massachusetts Lowell and Lowell National Historical Park, the exhibition is the centerpiece of 'Dickens in Lowell', a seven-month slate of performances, speakers, and family programs that together add up to the largest Dickens bicentenary celebration in New England.